I know it sounds odd, but lately I don’t know what I love. I mean I can name things I love, the things I’ve always loved, the things I’m supposed to, that which is obvious. But the truth is, there’s a kind of distance, a numbness, a too-busy-to-really-feel how I feel about much. Not a pathological dissociation, just a sense of going through the motions. I can put it down to being in a foreign country, to having willingly left a home I loved and entered another place* where I don’t know whether or not I belong, to being the go-to-person at home, to not being compelled enough to work on the (ideally) fulfilling work that I know, rationally, could give me a sense of purpose. Tributes to Ray Bradbury were everywhere right after he died. I can’t really add anything that hasn’t already been said in gratitude for the pure happiness and play he brought to the world. Maybe his influence was too strong – to this day I hesitate to commit to important things, fearing my butterfly decisions will irrevocably change the world, my world, in unwanted ways. Then sometimes, I’m just bold. We up and move overseas, I plunge into something new. Love. Fall in love and stay in love. Write only what you love, and love what you write. The key word is love. You have to get up in the morning and write something you love, something to live by. That is profound in every way and I’m a struggling disciple. This month I’ve made a commitment to write something every day – ideally fiction, so I can disabuse myself of the notion that I’ve got no stories to tell, but realistically it can all be experimental, slice-of-life, whatever. Not journal writing/ranting, not blog posts, but snippets or more of a scene, an event, a location, and something happening, something I love, even if it’s just the floating wooden puzzle box from last night’s dream that’s the only thing I love at this moment. Put it in, get it written. 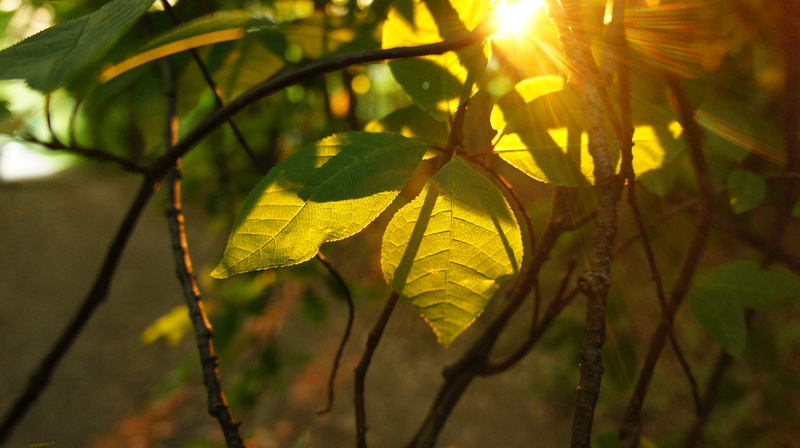 I know I love light through leaves. I started there.